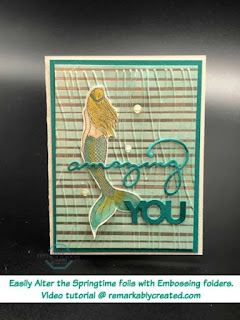 Thank you for joining the Crazy Crafters team today as we hop together with our special guest Janet Wakeland! We will all be casing her today - Casing is Copy and Selectively Edit for us. Here is the card of Janet's that inspired my card today. 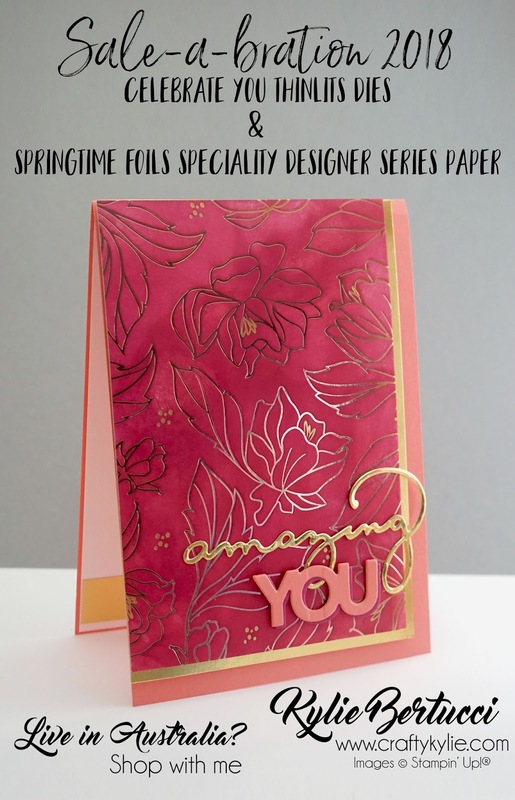 I loved that she used the Springtime Foil Speciality Designer Series Paper and coloured it. I also decided to use the same thinlits too. One thing I love to do is Chop my Designer Series Paper and use it. Especially this stunning Sale-a-bration paper that is FREE with a $90 order in Australia. You can do that on my online store here. I used my sponge daubers with Berry Burst Ink on the Springtime Foils paper. 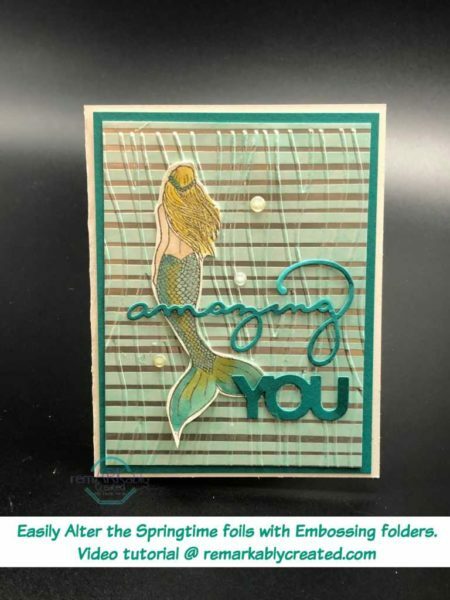 I will be showing how to make this card on my live video on Monday if you wanted to come and join me. I would love to see you there. Monday 12 March 2pm AEDT. 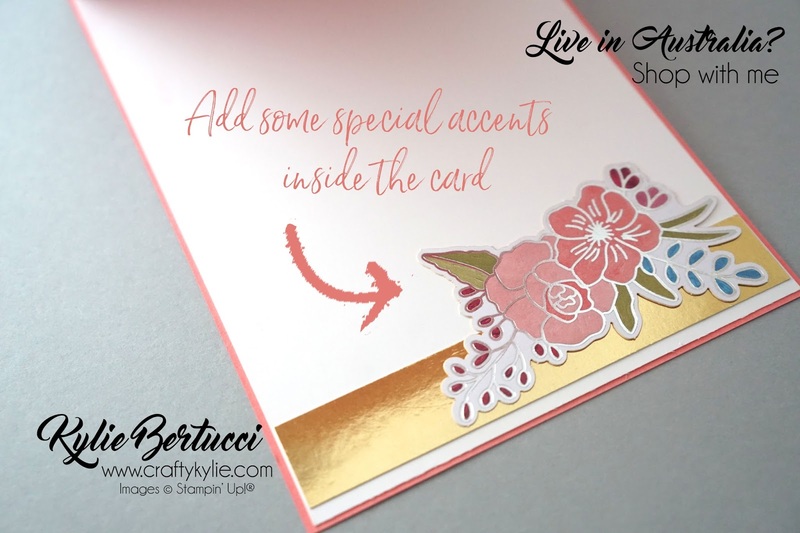 I love the thinlits - they are just stunning especially with some gold foil. The Multipurpose adhesive sheets are so good to use with these small thinlits. I hope you have some. Inside the card I used the gorgeous Sweet Soiree Embellishment kit to add that WOW factor inside the card. Do you like decorating inside too? I feel like my card is undressed if the inside isn't completed. Thanks again for coming to check out our hop and my project today. I hope you are inspired to #loveitchopit - get your Designer Series paper and CHOP it. If you love you paper you will chop it and use it. I would love if you could pin my projects too - that way others can hopefully be inspired by it. Here are the list of those hopping along with us below. Make sure you don't miss one blog post. My team have worked very hard to show you some inspirational projects today that we know you are going to love. 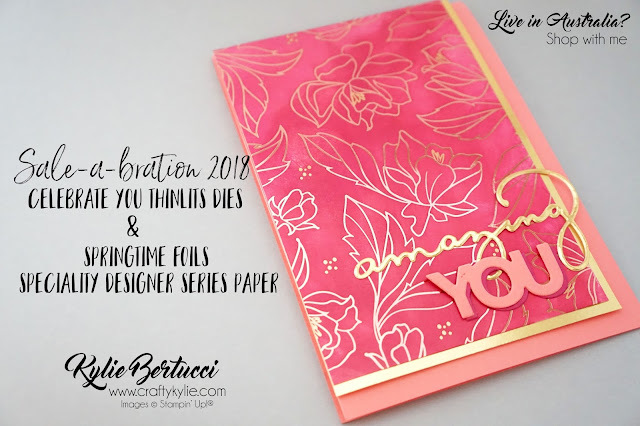 You are currently on my blog - Kylie Bertucci. Check in the list below to see who is next in the hop list. Thanks for coming!